Want to listen to audio books but don’t want to break the bank? Here are 10 places where you can download or stream free audio books! You all know that I love audio books with all my heart, but it can be an expensive habit. So any time I can get free audio books, I am going to take advantage of it! Between the public domain, free audio books trials, and the public libraries, there are quite a few ways to grab audio books free when you need something great to listen to. Here are ten places to snag free audio books! Audible isn’t free, but you CAN sign up for a 30-day free trial and get two free audio books of your choice, and you’ll own them forever, even if you cancel your free trial before it converts to a paid account. If you need some suggestions for audio books, here is a list of 25 of my favorites across a variety of genres. And I also wrote this post earlier this year with everything you could want to know about Audible. 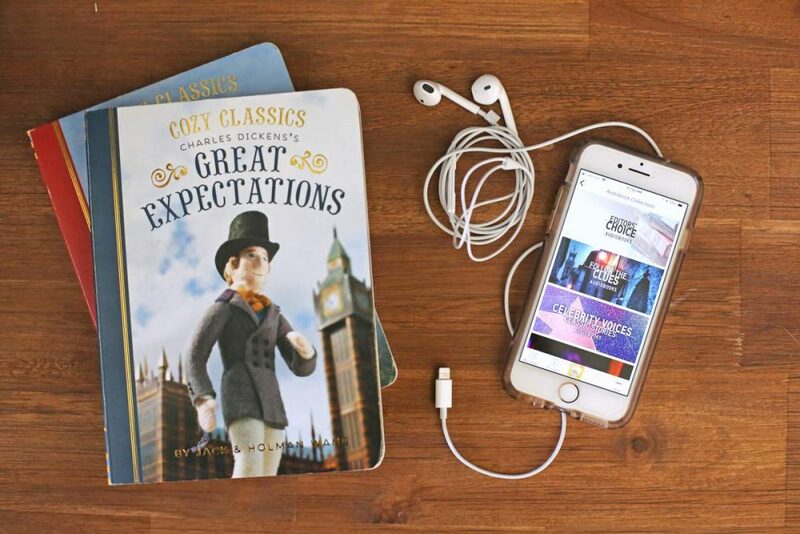 If you’re a Prime member, you can download the Audible app (it’s a free audio books app!) and then under the Channels section, they have selected audio books free for streaming. They change frequently and it’s fun to see what they choose to make available! Playster is basically like Netflix for audio books – instead of having a credit each month like Audible to choose specific audio books, you have access to their entire library (more than 100,000 titles) and you can listen to whatever you want for your monthly fee. It’s $14.95 per month (the same as Audible) but you can sign up for a free month trial. It’s similar to Audible (although it has a smaller collection) and you can . . . surprise: sign up for a free trial and get a free audio book. This is how I listen to most of my audio books and how my children listen too. It’s connected to my library account and I can check out up to 10 free audio books at a time, although sometimes the hold lines are insane. Overdrive is the most common library audio book provider, so odds are very very good that your library uses it too. And you’ve already paid for it with your tax dollars so free audio books for everyone! (I like using the Libby app better than the Overdrive app and I talked about why in detail in this post). My library system also uses Hoopla to offer their patrons audio books free and I like it because, unlike Overdrive which functions on a physical library type system where there are limited copies of each audio book and you have to wait in a hold line for a copy to come available, Hoopla has every book available immediately and instead limits you to 10 titles per month. I’ve found that the collections are usually much smaller, but I’m surprised at what I can find there! This is similar to Overdrive, where you wait in a hold line and can check out and listen to audio books or check out magazines, e-books, videos, and games. I especially like that, at least through my library system, it has a lot of free audio books for kids. Librivoc is a free audio books app for books in the public domain (so mainly classics). They’re read by volunteers, so the quality of narration can vary a lot, even within one book if it’s read by different narrators. We use Spotify daily to play music, but I only discovered recently that they have a decent little collection of free audio books too. Book Riot put together a nice little tutorial about how to find them here! This is a summer program that, unfortunately, is finished for the year, but each summer, they offer a pair of free audio books each week – one is a classic and one is a young adult new(ish) release. You’re a mind reader! I’m going on a long trip in the car this weekend and was just thinking I need to download some new audiobooks- now I’m excited to try out some of these things I’d never heard of before! I use Overdrive and hoopla all the time! Note that loan limits vary: I can borrow six books through Overdrive at a time, and four per month through hoopla. Yes! Thank you for mentioning that! I love Playster! Been using it for 6 months now and it’s way cheaper than audible if you factor in how many books you can read per month. Have you heard of Scribd? It’s similar to Audible but also has ebooks and magazines (I don’t use Audible so I don’t know if they have those too). Anyway, it’s $9/month and I signed up for a two month free trial. It was great! The app can be glitchy sometimes but the selection was so good. FYI, not all (smaller, rural) libraries offer overdrive or hoopla, HOWEVER!!!!! most states have a big state library (like Free Library of Philadelphia or Boston Public Library, for example) that allow ALL residents of a state to sign up for a digital library card and access e-services like Hoopla, Overdrive, Kanopy and many other things. My library has Overdrive, but not Hoopla or Kanopy, but through the Free Library of Philadelphia, I am able to check out books and audiobooks from other services. So if you don’t have access at your home library, reach out to the biggest library in your state! This is an AMAZING tip. Thank you so much for sharing. I downloaded Audble to use my Prime account (the Scarlett Johansson narrated version of Alice in Wonderland sounds great!). How long do books typically stay available in the Channels section? Is there a chance I can start it and then it is removed after a few days? 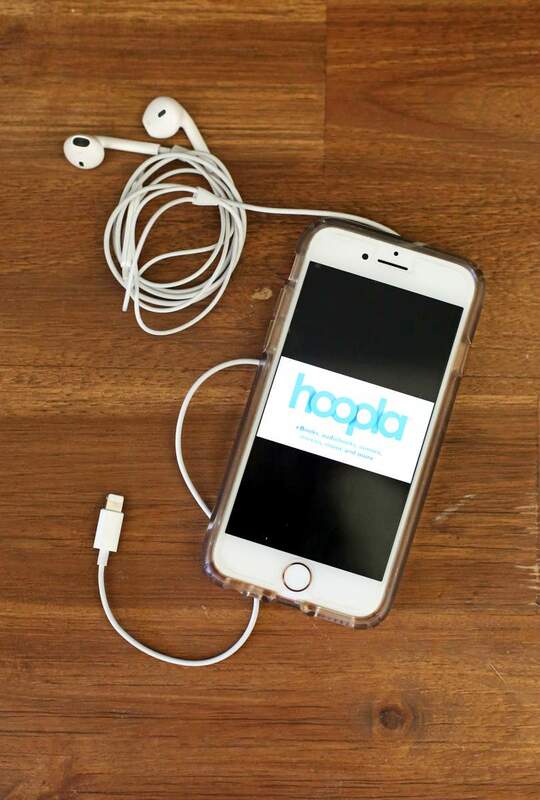 I am also downloading Hoopla right now to check it out. I mostly use Overdrive and have been really happy with the selection our library provides. I have Libby too but I am so used to the interface of Overdrive, it is hard to make the switch. RBdigital and Librivox were my first introductions to audiobooks and I used them frequently until I heard about Overdrive. Thanks so much for the great tip about Audible Channels, I have the app downloaded but had no idea about that! Now that Libby makes it so much easier to manage multiple library cards, I have 4 cards (from three different libraries) so that I can have 28 holds at a time. Helps w/the long wait times. The Murray City Library lets anyone get a card for free and they have their own Overdrive collection with shorter wait times. We were chatting about this at book club, where I learned that the cheapest non-resident library card in my area can be bought for $10 a year at one of the smaller city libraries. So if I ever decide I want to be able to get more holds on Libby I think it might be worth it.